A real pleasure staff was helpful and pleasant. Very warm and cozy place with all the amenities of home. They [Great Smokys Cabin Rentals' staff] knew all about the property. It was perfect for our family gathering for a graduation from Western Carolina. The cabin was perfect, the view was spectacular, and an easy and secure check in / check out procedure was flawless. Can't even begin to tell you how much fun we had here at the cabin for our daughter's graduation! This defiantly was the way to go. Away from all the hustle and bustle and able to truly enjoy all the family here! We grilled out, made smores and enjoyed the porch a lot. We defiantly recommend you and this beautiful cabin to others. We will be calling for another stay soon. Thank you for a wonderful retreat, We loved the sounds of the creeks. We loved the hot tub and porch swing. WCU graduation was a blast. My Boyfriend took me here for our one year anniversary. This place is beautiful and the cabin felt like home. The Dollar General has been a God send. We have been eating smores every night. The hot tub was the perfect remedy for our sore muscles. We have had an amazing time. This cabin was the perfect cabin to setting to bring us closer together. Thank you. Always very pleasant and helpful. Everything we wanted out of the cabin and more! Absolutely gorgeous. This is my 3rd stay at this wonderful cabin. It is perfect from the comfortable beds to the fantastic views. I never tire of that view. Bryson City is always interesting and as always there are lunch's at the NOC. WE want to thank you for allowing others to stay here. Very best of wishes. Was pleasantly surprised to receive a check-in call from Kathy to ensure that we were satisfied with the cabin. That was a first for me! It was nice to know that if we had any issues help was readily available. It takes a little more effort than usual to get up to Mountain Lure, but it is well worth the climb! Very homey feeling, nice layout & has everything you could ever need for a mountain getaway. Great price & perfect location. 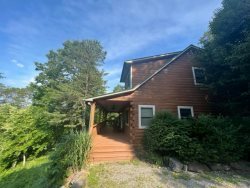 Found the cabin on Flipkey. The overall open layout was perfect for 4 adults with a ton of fly-fishing gear! We spent our 1 year anniversary here. What a great spot. Check out Cork and Bean and Nantahala Brewing CO is #1 as well. This was a very pleasant place to stay after long days of work. We were able to relax, hike in the Joyce Kilmer Forest and Deep Creek. Then come back to soak in the hot tub. The cabin was super clean and comfortable. I love going right to the property without having to go to an office. This was very convenient. Bear Hug is a beautiful cabin and the view was tremendous. We would stay here again. We had a sisters and cousins reunion here in Bryson City. The home was very lovely and user friendly. We thoroughly enjoyed it, especially the porch. We hiked trails at Deep Creek, went to Cherokee, Clingman's Dome and saw a bear and elk. As well as drove to Maggie Valley, and traveled the Road to Nowhere. We had a lovely time and can't wait to return. Thank you very much, we have had a good time. We really like the place and we will come back and refer you. Again Thank you. What a great little place to find last minute! We did so much in our 21/2 days here. Cherokee, Trout Fishing, horseback riding yard sales and so much more. Lots of fun. Can't wait to come back. This has been such a Wonderful vacation! I am so sad to leave! I got to relax while hubby got to go fishing. We got to explore the trails behind the cabin and we had so much fun! Thank you so much for such a serene vacation. I came up here for a quiet getaway to study for exams and bike during my study breaks. I got to visit Bryson City and greatly enjoyed it. I ate at some very good restaurants. IT was exactly what I was needing can't wait to come back. Beautiful cabin. Very relaxing time! My husband and I celebrated our 20th anniversary with our son and daughter. Hot tub in the snow was the best! Everything was perfect.